No Nate, no problem for the Carey High School boys’ varsity basketball team. Playing for the third straight game without its top scorer, junior guard Nate Adamson (17.4 ppg), Carey relied on its younger players to rally past the Lighthouse Christian Academy Lions 60-58 Tuesday night in a pivotal Northside Conference clash. Freshman guard Toby Whitworth scored a season-high 15 points on five 3-pointers and sophomore Collin Whitby (20 points, 8 rebounds, 3 assists) made key free throws down the stretch to compensate for Adamson’s absence due to sickness. Lighthouse, with five seniors compared to Carey’s one, built a 35-27 halftime lead by outscoring the Panthers 11-3 at the free throw line before intermission. Carey’s second-leading scorer, Joe Parke (15.4 ppg) played only four minutes of the first half after picking up three personal fouls. Yet Carey’s defense and its outside shooting were dominant in the third quarter when the Panthers outscored Lighthouse 20-5. The Lions didn’t score at all for four minutes. 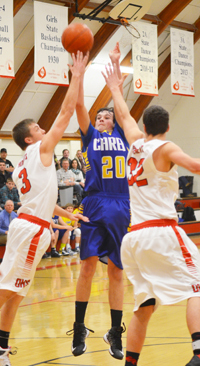 Toby Whitworth drilled three 3s in the third sparking Carey on 9-0 and 11-0 runs for leads that crested at 10 points. Although Carey showed some nerves with eight of its 22 turnovers in the fourth quarter when Lighthouse cut its deficit to 60-57 with 37 seconds left, the Lions couldn’t come up with the equalizer and Whitby made six free throws in the final period. Carey junior Matt Whitworth (12 points, 13 rebounds, 2 steals) had eight rebounds after half. Before fouling out, Parke (7 points, 4 rebounds, 2 steals) played well defensively in the third helping the Panthers pull away a little. Junior guard Chris Peck (4 points, 4 rebounds, 8 assists) also got the offense in gear. Lighthouse put three players in double figures—Erick Helman (17 points, 6 rebounds), Jake Millenkamp (10 points, 5 boards, 6 steals, 3 assists) and Josh Fadness (10 points). But Carey out-rebounded the Lions 36-24. With the win, Carey (11-7, 7-0 league) stayed unbeaten in the Northside and assured itself a shot at the conference championship when the Panthers host defending league champion Dietrich (15-3, 7-0) Friday, Feb. 14 in the regular-season finale, in Carey. Dietrich and Carey, last year’s tournament finalists, will be the top two seeds when the Northside tournament opens Feb. 19. Lighthouse Christian (11-7, 4-3 league), last year’s third-place Northside team, is fighting it out with Richfield for the third seed. In a nip-and-tuck battle, the Carey High School girls (3-14, 1-4 league) nearly won its “Senior Night” game against Lighthouse Christian (8-8, 2-3) on Tuesday night in Carey. But with two seconds left, Lighthouse junior Jackie van Vliet (8 points) scored close to the basket after a pass from Anna Pridley (8 points) lifting the Lions past Carey 36-35. Carey had seized a 35-33 lead with three minutes left when junior Natalie Villanueva (12 points) finished a three-point play on a pass from Lilly Rivera (3 points) after a steal on the defensive end by Kylie Castle (5 points). Sophomore Medin Cenarrusa (a game-high 14 points) led Carey’s rally from its 17-8 deficit in the second period. The outcome meant No. 5-seeded Carey travels to No. 4 Lighthouse Saturday, Feb. 8 at 7 p.m. for a first-round game of the six-team Northside tourney, at Jerome Middle School. Saturday’s other game sends No. 6 Murtaugh (0-5 league) to No. 3 Castleford (3-2). Richfield (16-2, 5-0) earned the top seed Tuesday with a 47-43 home win over Castleford. Dietrich is the No. 2 seed. The five-team double elimination tournament continues Monday, Feb. 10 with two more 7 p.m. games at the team with the higher seed. Shoshone High will then play host to three more days of tournament action Tuesday through Thursday, Feb. 11-13. Consolation and championship games will be played Wednesday, Feb. 12 at 6 p.m. and 7:30 p.m. at Shoshone High. The second-place game to determine the district’s other qualifier for the State 1A Division 2 tournament Feb. 20-22 at Nampa High School will be played Thursday, Feb. 13 at 7 p.m. on the Shoshone floor. · The No. 6-seeded Wood River High girls’ varsity (6-13) played well in the first and fourth quarters but fell 45-33 at the No. 3 Jerome Tigers (16-5) Tuesday in the first-round of the six-team Great Basin Conference tournament. Top scorers for Wood River were Ciceley Peavey (9 points, 4 assists), Rory Cole (8 points, 8 rebounds) and Blair Radford (8 points, two 3-pointers). Wood River tried to stay alive Thursday with a consolation bracket game in Twin Falls against No. 5 Canyon Ridge (5-16). · GBC No. 1 seed Twin Falls (14-3, 8-0) won its 12th consecutive game Wednesday 58-29 over the Wood River Wolverine boys (3-14, 2-6) with 8-for-23 shooting from 3-point range. Wood River had no 3-pointers and was out-rebounded by the Bruins 23-16. Arthur Brugger (12 points, 2 rebounds, 2 steals), Cody Carter (6 points, 4 boards) and Eron Bates (5 points, 4 rebounds, 2 assists) led Hailey. Wood River hosts the Jerome Tigers (10-8, 5-3) today, Friday in Hailey. Jerome defeated Minico (5-11, 3-5) by a 63-42 score Wednesday night. The Wolverines have an outside shot at the No. 4 seed in the GBC tournament if they beat Jerome today and Canyon Ridge (1-16, 0-8) next Wednesday, both games at home, and Minico loses at home to Burley (13-4, 6-2) today and also falls to Twin Falls next Wednesday.